I was asked recently when on this trip I had particularly felt I was somewhere else. Well, running, last Friday. It was a gray, cold, drizzly morning with a strong wind, easily run-in-a-fleece weather; a day worthy of Michigan at the end of March (remember, we just celebrated the first day of spring). The wind was stronger by the river, and stronger yet as I turned back and realized I had had it behind me; the rain stung my face and my ears. The river looked brown, as usual, but high and choppy. Then I saw a tero. Two, actually. I recognized them by appearance, not by name (those who know me can testify I'm no ornithologist), and I recognized their appearance because I'd been looking at photographs. When I first read the sentence in the book I'm translating --he looked like a tero-- I had no idea. It could have been anything: a kind of rodent, a local bogeyman, an aristocratic dandy. It took some dictionary rummaging, a trail from a more local name to a more general name to a comparison of photographs to settle on the English. Tero to Teruteru to Southern Lapwing. It was bumpy ground, rough grass and not-quite-park just where the construction site started. The two men I usually see practicing Tai Chi (always on the danger side of the keep-back sign meant to protect the unwary from the eroding bluffs) were posed in the distance. I was pulling my cold hands further into my sleeves when the dark, trailing crest at the back of a bird's head caught my eye. And I thought, I really am somewhere else now. Does it help the translation? Change it? It did push me toward using the local name, not the English name of the bird. 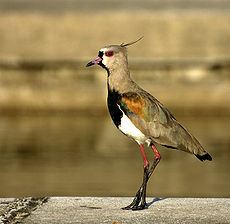 Wikipedia will tell you about the Tero in Spanish or the Southern Lapwing in English. Lapwing now seems too domesticating (and, perhaps contradictorily, needlessly distancing; the reader who doesn't know her birds won't know a southern lapwing from a cedar waxwing). Also, to me, lapwing sounds somehow more fluid in its movements, not poking and jumping on the ground like the birds I saw, longish-legged and knobby-kneed, like miniature heron relations. But will the reader know a tero is a bird if I don't add other pointers? It's still a work-in-progress. For now, I've got both names in the draft. What a beautiful bird! And what a thoughtful post. As the world becomes more cosmopolitan and culturally homogeneous -- Indian street food available in New York City and McDonald's available in Delhi -- native animals and plants may be the last things left to let us know where we are. I had a chance to visit Pakistan and India some years ago, and was amazed at how different those places were from my home. But the moment I felt most profoundly that I was somewhere else was when we were picnicking on the grounds of a Mogul tomb in Lahore, and got pestered by the wild monkeys. Thanks for reminding me of that moment, Amalia. And regarding your tero revelation, as my mother would have said to me at such a moment, are you writing this down? We hear a lot about invasive plant species, and people have certainly introduced fauna far and wide. But the particular's still out there. I'm struck by your choice of words, Ruth: cosmopolitan sounds warm and desirable and open; culturally homogenous stultifying and bland. And, yes, I'm writing it down! I loved this post! It's the reason why I was drawn to translation in the first place, and I debated several similar word choices in the translation I'm working on (for types of carraiges/wagons, rather than birds). I remember reading a article by Rosario Ferre about her own "translation" process from Spanish to English (which sometimes involves adding whole paragraphs in the English version!). And I agree, the word in Spanish seems to fit much better, somehow, with the picture you added. Thanks, Erin! I hope your translation's going well, too--I look forward to reading it! Yes, Amalia, I think you're right that "Southern Lapwing" might be too domesticating. Just those words conjure up a bird from the southwestern US for me. But "tero", while local and injecting that flavor of the original, doesn't necessarily let me know it's a bird at all. I'd add a modifier or description, depending on your context of course. Great dilemma. Let us know what you decide?! I'm trying to work "bird" into the sentence-- "birdlike man who looked like a tero", something like that. Because yes, the more I think about it, the more wrong "lapwing" seems: domesticating without necessarily clarifying, sort of the worst of both worlds.